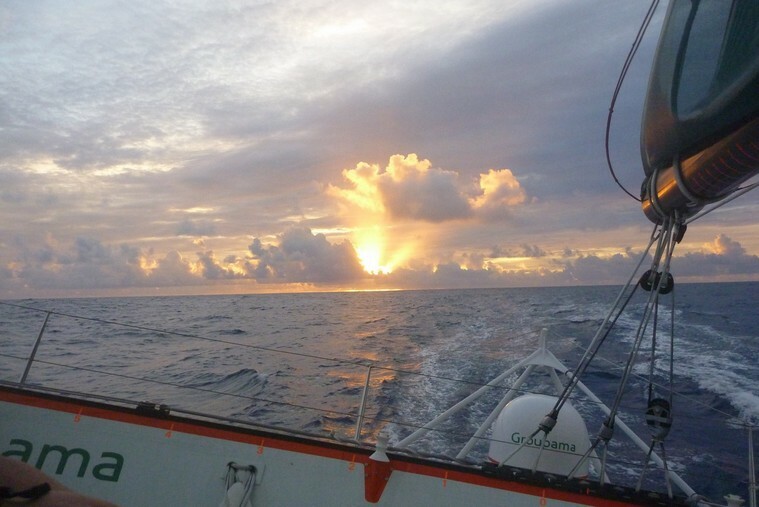 How crazy are the French about long distance adventure sailing? Crazy enough that photographer Yvan Zedda could get a plane ride and a picture to be captioned thus: Flyby of the maxi trimaran Groupama 3 to the NE of the Azores aboard a Falcon 50 fleet 24F from the Naval Air Base of Lann-Bihoué. Groupama 3, with skipper Franck Cammas and American übernavigator Stan Honey making the calls, is likely to cross the finish line of their round-the-world dash with a new Jules Verne record at more or less the time that a very different multihull, Plastiki, is set to embark from San Francisco on a very different mission. 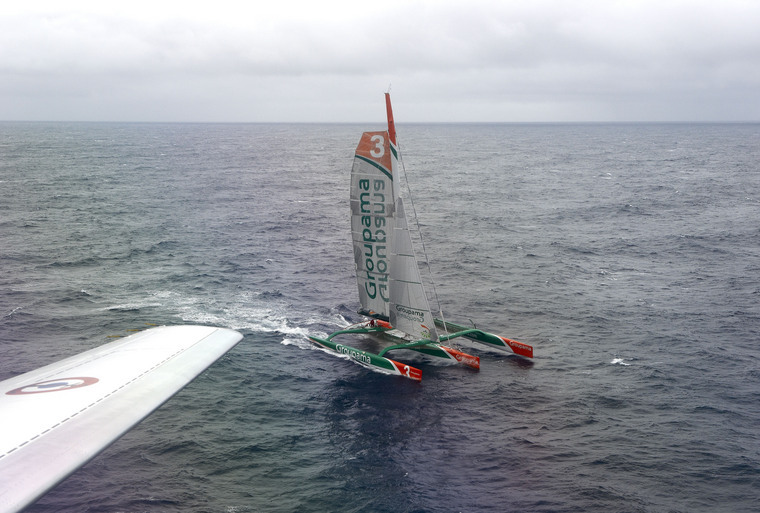 Groupama’s time to beat was 50 days, 16 hours. They had a lead of about 750 miles with 1,200 miles to go to Ushantan island marking the most northwest point of France, and the entrance to the English Channeland a forecast of moderate but changeable winds all the way in. From here, it looks like a lot of sail changes and a record. That’s the Atlantic they’re leaving behind . . . The thing to understand about the Plastiki is that we have here a recyclable boat. I’ll soon be saying “had here” as the crew has announced a plan to depart San Francisco Bay on Saturday, March 20 for a 100-day voyage to Sydney, Australia. Environmental crusader David de Rothschild originally set out to dramatize the absurd waste of plastic water bottles and other single-use plastic, but when he discovered that he could not build a boat completely from post-consumer materials, the disappointment led to an inspired alternative. Plastiki has been four years in the cogitating and building, and yes, there are 12,500 recycled plastic bottles in the hulls contributing most of the boat’s buoyancy. That’s a visual statement for the cameras. But what makes this more than an eco-stunt is the structure of the boat itself, built using a self-reinforced thermoplastic, srPET, that is fully recyclable and the first of its kind. But not the last? The crew has been working “around the clock” they say, and the intent is to cast off from Clipper Maritime Center (Sausalito, California) at 0930. Usually, that would be too early for the seabreeze, and we’re seeing a hot spell and light wind as of Friday afternoon so—we’ll see, won’t we. My fuller take on Plastiki is here, and the crew’s new website is here. Dubai: Sammy, the whale shark that had been held in captivity in the Atlantis, Palm Jumeirah aquarium for the past eighteen months, is freed. The release comes almost a year after a popular Gulf News led campaign had thousands of Dubai residents calling for the hotel to release Sammy. The campaign involved badges, bumper stickers, jingles and a Facebook group that attracted several thousand members. Atlantis issued a press release stating that the mammal had already been released. Whale sharks are listed in appendix 2 of the Convention on International Trade of Endangered Species, which stipulates that they can only be held for scientific purposes provided that it does not harm the survival of the species. Earlier, Ali Bin Saqr Al Suwaidi, president and founder of the Emirates Marine Environment Group had confirmed that the whale shark was set to be released. “An animal of this size cannot be kept in captivity for such a long time,” he said. Thomas Coville is one of the helmsmen on Groupama 3. He’s also a guy with his own program on the maxi-trimaran Sodeb-O, which is coming to the end of a four-month refit. You can expect it to be lifting on foils after the relaunch, with Coville soon off on a transatlantic test. There’s this theory about less boat in the water . . .